Home › Tools › What Is Offervault.com? What is Offervault.com? Well, as they describe themselves, “The GoTo Source For Affiliate Marketers.” It’s basically a research tool used to find affiliate and CPA programs to promote. Website owners or affiliate marketers can find products and services in which to promote potentially. To be able to make money online by owning a website you most implore tactics to either have visitors to your site click links and buy something (affiliate links) or CPA (cost per acquisition). Offervault brings a multitude of business in one place that pay website owners for completed purchasing or CPA. So primarily, you could be searching their 61,488 CPA or affiliate programs in seconds. With all critical parameters laid out to get you quickly find the specific right one for you. To further refine your search, you can also click the following. You could potentially be searching less for the number of features offered. The option doesn’t stop there either. You can also set your search to a Set Country, or load your Search Preference, or Advanced Search. You can save your searches only if you sign up with Offervault. The first thing to do is sign up with Offervault, you don’t have to necessarily sign up with them, but this allows you to unlock features on the site that make it much easier to use. Like saving searches, view landing pages for international countries, and to all set up email alerts. Next, you search for the topic you are interested in, all the while narrowing the search by using the many parameters. Then Click the orange button labeled Join Network. This is the part that seems redundant, and you must join that specific affiliate program, basically a double registration. My first thought was, why? But don’t let that stop you from using something you want to use. A lot of the time you must also wait for approval from that company, as that might take a day or two. You don’t have to join to use Offervault but if you join you will have more access to information to keep you informed. Really like the feature of saving your search into the Favorite Searches, thus allowing you access it at any time. Their webinars are plentiful and a free resource to help become more successful with affiliate marketing. Highly refinable search feature! With many options to choose this will surely get you the results fast. A live ticker that streams other users searches, great if you’re looking for new ideas. A vast number of offers to choose from. At the time of writing this, there were 61,488 offers available. The whole alphabet soup of affiliate networks to choose from, CPS, CPA, CPC, and lead generating. They have a very informative blog, called Scoop. This packed full of useful information. 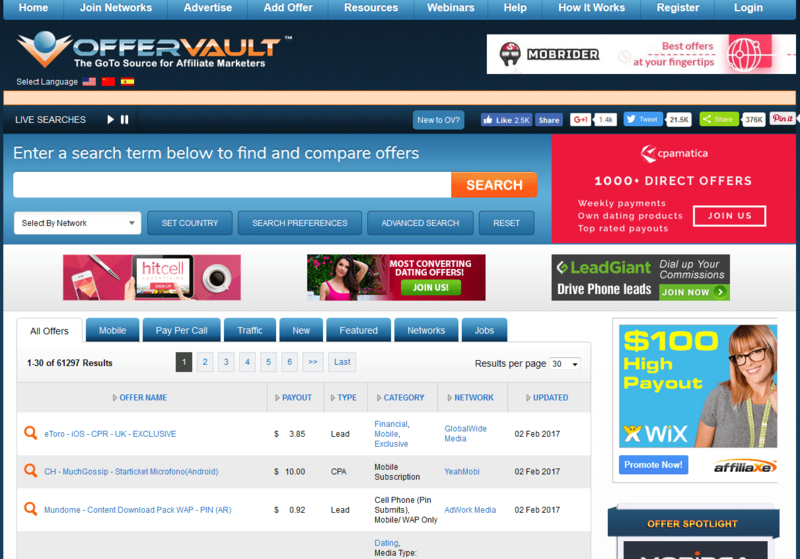 As apparent by their website Offervault offers the ability to advertise on their site to increase your exposure. Must sign up for access the whole site, as some features you must be logged in to use. The site is very…how should I say it, cluttered as f**k. My eyes are getting tired fast from the sheer amount of ads placed throughout the site. Once you find a product you want to promote, you must then join then wait for approval from that specific affiliate network. You might end up being rejected from promoting from affiliate networks. This could be a whole host of reasons, like you live in the wrong country, etc. Could be a lot of competition in a chosen field, so be prepared. The number one tip to using Offervault is signing up for an account, you don’t have to use this site, but when you sign up, you are allowed more tools and access to more information to help determine what affiliate or CPA is right for you. Check out the streaming ticker to get good new ideas for possible promotions. oDigger is a site very similar to Offervault and might be worth a look see. Offersearch is also another one. For specific products, I really like promoting Onnit products. All products are high quality, and it’s just a great website. Sign up with Onnit and start promoting a great line of products and get good percentages of the sale you generate. This is for affiliate marketers who are looking for affiliate programs in which to promote via their websites. 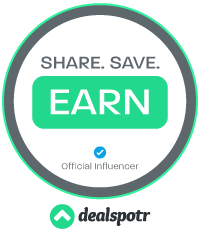 Offervault offers numerous tools and training to help the complete newbie to the experienced affiliate marketer through their Webinars. They have many top affiliate marketers teaching various strategies. With over 140 webinars…surely there is something to learn from here. They also offer a video to help you understand Offervault better along with a general Help page. The support at Offervault is in the form of two types. Email and phone support. Just like dirt, it’s free. You can either sign up or not too. Signing up will allow you more options, and I recommend signing up if you plan on using Offervault. If you are searching for an affiliate program in which to promote via your website, Offervault might just be the best place for you to find that particular product to promote. Need I remind you that use of Offervault search function is free to use. They also offer free webinars to help you refine your affiliate techniques from industries leaders. This could help you find the right program for you and get you earning money online, so check it out. If you use it and like or dislike using it, comment below as I would love to hear other people’s opinion on the matter. If you are an affiliate marketer and need somewhere, you can learn, grow and network with other like-minded individuals, I highly recommend you check out my #1 Recommended Program to accelerate your learning and techniques to the next level. It is what I use to own and grow my own online businesses. Take a look and get started today. ‹ Is BeFrugal.com A Scam?